Even before the Christmas city lights go up, everybody is rushing to tick their shopping lists and hit the shops to score early bird discounts and other great bargains. With the convenience mobile devices offer, people increasingly prefer to pay using their devices as it simulates an all-in-one experience for busy people on the go. While you’re using your handheld device, you can instantly make a transaction with it as well, without having to fish for your wallet and risk misplacing other belongings especially in crowded places. While mobile payments do come with such threats, this payment method is still favorable to many users, especially for the coming shopping season where people will be more inclined to pay using their devices to save on time and effort. However, it still pays to be smart. Equip your mobile device with proper security software to block malicious apps. Make sure that you only connect to a secure network and avoid public or open Wi-Fi. Before making a transaction, always double-check if you’re using the right payment app. Finally, update your passwords and use unique, hard-to-guess passwords for both emails and apps. 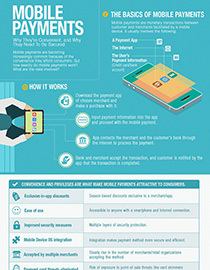 Learn more about mobile payments and how you can stay secure by clicking on the embedded infographic.